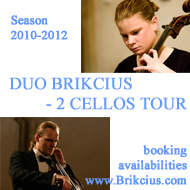 As a part of the European Days of Jewish Culture you are invited to another "Duo Brikcius - 2 Cellos Tour" concert of two Czech cellists (and siblings) Anna Brikciusová and František Brikcius. Concert will be on Monday 14th September 2009, 7pm, at the Divadlo Oskara Nedbala Tábor (Divadelní 218, Tábor, Czech Republic). In addition to Fantasie IV (2008) by the Czech composer and organist Irena Kosíková, Duo Brikcius will feature Duo for Violin and Cello (1939-40) by the Jewish - Terezín composer Gideon Klein, as arranged for two cellos. Held under the auspices of the Prague City councillor for culture and heritage and the Italian Culture Institute in Prague. Concert will feature music by L. Boccherini, W. A. Mozart, G. Rossini, P. Hindemith, G. Klein and I. Kosíková as well. In the cooperation with Divadlo Oskara Nedbala Tábor. "Duo Brikcius - 2 Cellos Tour" concerts are participating at the "Daniel Pearl World Music Days" festival. For more information please visit http://www.Brikcius.com, http://www.DivadloTabor.cz and http://www.DanielPearlMusicDays.org . 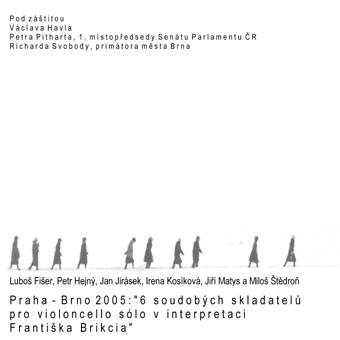 Competition: Win 1 x CD "Prague - Brno: 6 Contemporary Composers for Cello solo in the interpretation of František Brikcius"
Where was deported philosopher Karel Kosík (father of Czech Organist and Composer Irena Kosíková) during the World War II? Contest is over, drawn winners are: G. P. from Terni, J. M. from Tábor and A. M. from Lišov. Akce.cz is media partner of projects "MAKANNA", "eSACHERe" & "Brikciusová Na Prádle". Karel Kosík, one of the most innovative Czech philosophers, was born in Prague on July 26th 1926; he studied on gymnasium in Slovenská Street in Prague. On November 17th 1944 was arrested by Gestapo for illegal antifascist activity in resistance group Předvoj; prisoner at Pankrác in Prague and later deported to Terezín (Small Fortress). He studied philosophy at Philosophical faculty of the Charles University in Prague, Philosophical faculty of the Leningrad University and Philosophical faculty of the Lomonosov University in Moscow. He graduated in 1950 in Prague at the Charles University. In this part of his life he met his future wife Růžena Grebeníčková (later laureate of Herder prize), from this marriage came three children (Antonín Kosík, Irena Kosíková and Štěpán Kosík). 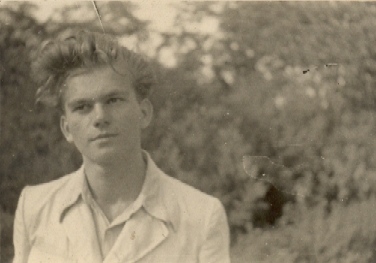 During years 1952 - 1969 he is working as a scientist at FÚ ČSAV. He is invited to give lectures all over the world (Venetia - 12th International philosopher congress, Mexico - 13th International philosopher congress). In 1963 is published his major work the "Dialectics of the Concrete - A Study on Problems of man and world". Since 1968 he is regular professor of philosophy at Philosophical faculty of the Charles University till 1970, when he is excommunicated. From 1971 till 1990 repeated visits from the state police (Stb) at his home; confiscating of his manuscripts, notes and books. The complete work of Karel Kosík is banned in all state libraries. After the revolution in 1989 is Karel Kosík again at the Charles University (1990 - 1992) and FÚ AV ČR (1992 - 2003). He is invited to give lectures in Europe (Prague, Barcelona, Paris). He is in 1999 awarded Tom Stoppard Prize by Charta 77 for his book "Předpotopní úvahy"; in 2001 in Klementinum - Mirror Chapel is given to Karel Kosík Artis Bohemiae amicis Prize by Czech ministry of Culture. Karel Kosík is dying in Prague, February 21st 2003. In 2006 in cooperation with National Library of the Czech Republic and Philosophical Institute of the Academy of Sciences of the Czech republic was released project "In the memory of Karel Kosík I. & II.". For more information about philosopher Karel Kosík go to http://www.Brikcius.com and http://En.Wikipedia.org/Wiki/Karel_Kosík . 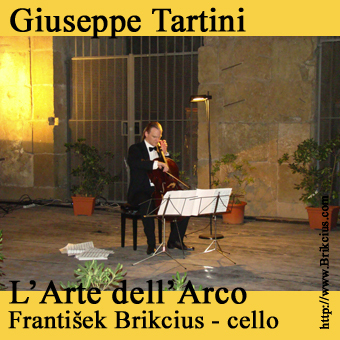 Support release of new CD "Tartini's Art of Bowing in the Interpretation of František Brikcius"
(each donation over 100 Euro will get free CD).